Daniel Smith in action this season for Featherstone Rovers, alongside new Castleford Tigers teammate Calum Turner. New signing Daniel Smith is looking forward to making his family proud when he is given the chance to run out onto the Mend-A-Hose Jungle pitch in a Castleford Tigers shirt. Local lad Smith, 26, will be achieving a long held ambition when he plays for the Tigers after growing up as a Cas fan along with his family. He will also be following in the footsteps of his grandfather Eddie Lavender, who played for Castleford in 1944-45. 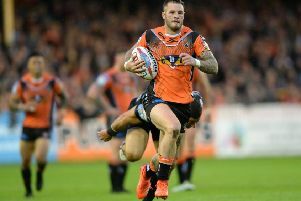 After joining the Tigers on a deal until the end of 2020 following his release by Huddersfield Tigers, Smith said: “It has been a dream of mine to play at the Jungle. “I used to be a season ticket holder and come down with my friends every week so playing here is something I am really looking forward to. “I live two minutes away and my family are happy about the move. Smith could go straight into the team to play Wigan Warriors tomorrow night and feels it has been easy for him to fit in straight away. He said: “I grew up with Greg Eden, used to go to the same school, and I know a lot of people here. Smith was born in Pontefract and played his junior rugby with local amateur club Lock Lane before joining the Leeds Rhinos academy. After a spell in Australia with South Sydney under 20s, he has gone on to play for Wakefield Trinity and Huddersfield Giants, but hopes to have found his home now with Cas. “It is my home town club so hopefully I can finish here,” he explained. “There was a bit of interest from Cas in the past, but I always went elsewhere and it never came about. But I am here now and I can’t wait to get started. There were a couple of other options, but I didn’t want to look away from here. “I wanted to get a deal done here and thankfully it has been and it has all worked out for me. “I like playing how Cas play. I am pretty good with ball in hand and I am hoping I can show that. “I realise there’s some very good forwards here and it’s a hard team to get into. Smith feels fit and ready to go after playing on loan at Featherstone Rovers. He said: “I have played big minutes every week for Featherstone. I know the Championship’s a step down, but I am pretty good with match fitness anyway. “I went to Featherstone at the start of the year just to get a bit of game time and ended up playing five or six weeks there. Smith has played at the Jungle before in opposition teams, but is eagerly looking forward to having the vociferous Cas fans on his side this time. He added: “I have played here and won here a couple of times – for Huddersfield and Wakefield – and hopefully I can win plenty more now I am playing for Cas. “The fans are good and it will be good to have them on my side. I can’t wait, whenever my chance is I will take it with both hands.